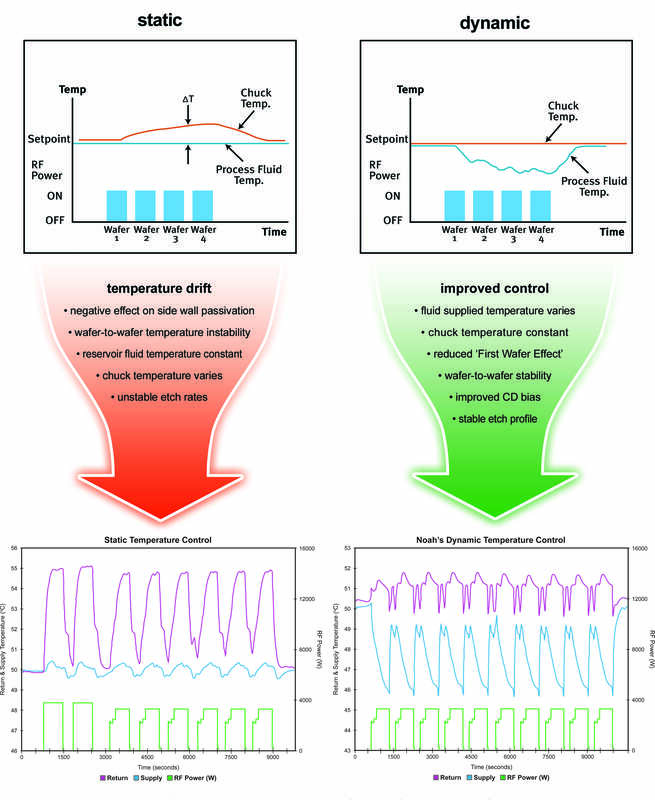 Dynamic Temperature Control is accomplished by sensing the temperature of the process fluid returned from the process chamber (wafer chuck) and varying the temperature of the process fluid supplied to the chamber to compensate for changing process conditions, in real-time. This will result in through-the-lot uniformity and chamber-to-chamber wafer processing uniformity. ...maintain the temperature set-point in a very large reservoir by cycling heaters and cooling control valves on & off, thus consuming about 50% more power than the LAUDA-Noah POU System. The fluid is pumped to the chamber from the static unit's remote location, typically in the sub-fab or 2nd level below the chamber. This distance can be as much as 50-75 feet away from the surface of the wafer. 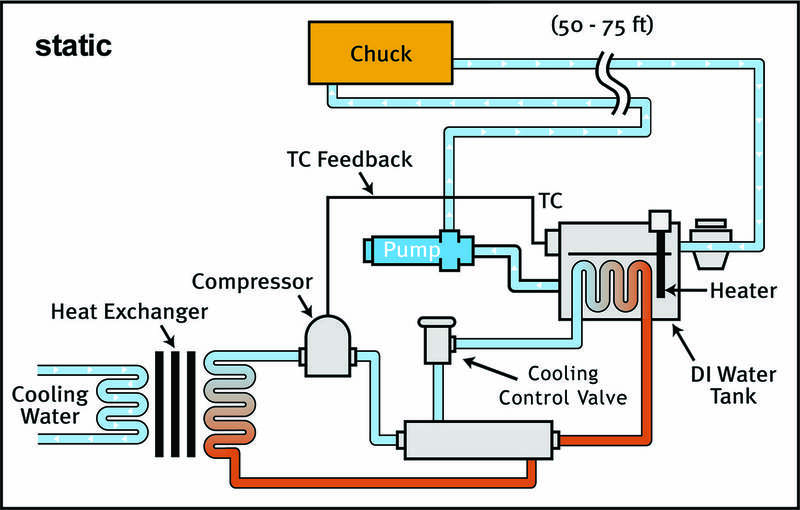 This results in large ambient losses that will vary from chamber-to-chamber, depending on the length of the process fluid hose, the type of hose used, routing of the hose from the sub-fab to the chamber and ambient conditions. When static units are employed, the wafer chuck will eventually reach a new equilibrium temperature since the static unit is not designed to compensate for changing process conditions. The data shown below is from an Asia Pacific wafer foundry. The 300mm chamber temperature profile comparison illustrates the performance of LAUDA-Noah's Dynamic POU system vs. a static unit on a high aspect ratio Etch process. Perhaps the most compelling aspects of this data set are the temperature uniformity and rapid response times accomplished under very high RF power conditions. 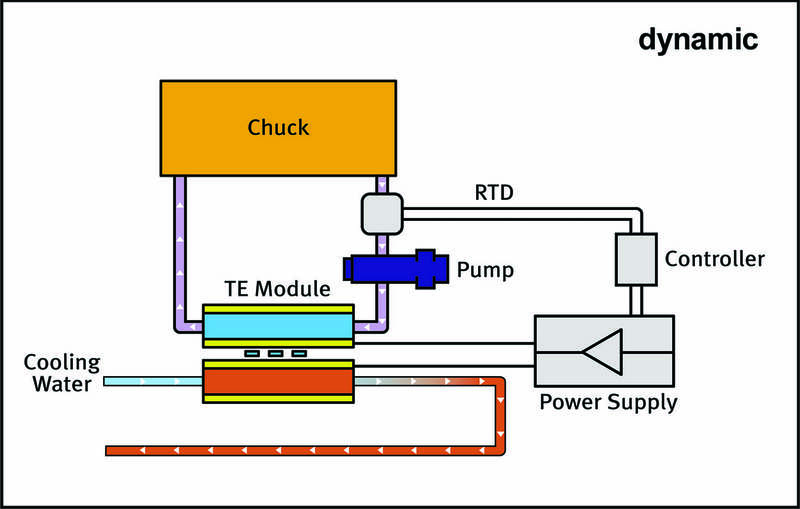 (~3.8kW) Note the wafer-to-wafer repeatability and constant baseline temperature performance when using the LAUDA-Noah POU system.